“Patients with a reset osmostat have normal osmoreceptor responses to changes in the plasma osmolality, but the threshold for antidiuretic hormone (ADH) release is reduced. As a result, the plasma sodium concentration is below normal but stable, since the ability to excrete water is maintained.” – Burton Rose, Clinical Physiology of Acid-Base and Electrolyte Disorders, 5th ed. In a recent teaching case published in AJKD, Andreoli and Whittier present a unique etiology of reset osmostat. Corresponding author and AJKDBlog contributor William Whittier (WW) discusses this article with Timothy Yau (AJKDBlog), AJKD’s Social Media Editor. AJKDBlog: This is a fascinating discussion of a patient who was eventually diagnosed with hyponatremia related to a reset osmostat. Before we get into the case, can you describe the normal response of the osmostat/osmoreceptor in healthy individuals? AJKDBlog: The patient in your discussion had a serum sodium of 115 mEq/L on arrival, and a urine osmolality of 759 mOsm/kg, which signifies the presence and activity of ADH despite serum hypo-osmolality. What made you think of reset osmostat in this situation rather than the usual causes of SIADH (Syndrome of Inappropriate ADH)? AJKDBlog: Can you categorize reset osmostat as a subtype of SIADH, and is this clinically relevant when treating a patient? WW: There is controversy about the reset osmostat being a subtype of SIADH or its own entity. The diagnosis of the former should be considered in those patients with stable mild hyponatremia (i.e. 125-135 meq/L) that does not change over the course of several days while solute and water intake varies. The key is to understand that in reset osmostat, the urine will dilute at lower serum osmolarity (i.e. with a water load), whereas in SIADH, it will remain concentrated in the presence of hypoosmolality. Water restriction is not a necessary therapy for reset osmostat, whereas it is first line therapy for most patients with asymptomatic SIADH. AJKDBlog: This patient underwent a water deprivation test after correction of his serum sodium to 127 mEq/L. Can you explain to our readers: 1) When this test should be ordered? 2) How to perform a water deprivation test? 3) How to interpret the results? WW: Classically, the water deprivation test is to differentiate between the causes of a dilute polyuria: primary polydipsia or diabetes insipidus (DI). This is performed by restricting fluid intake until the plasma becomes hyperosmolar (preferably in the hospital setting). With primary polydipsia, the urine will concentrate and the output will fall, as opposed to DI, where the polyuria persists, the urine remains dilute and hypernatremia will develop. DDAVP is given in the latter case to distinguish nephrogenic versus central DI. In our case, his serum sodium had appropriately increased from 115 meq/L to 127 meq/L over two days while holding his DDAVP. During this time, he was given Dextrose 5% in water (D5W) to prevent a rapid increase in his serum sodium concentration. We had expected his urine to remain dilute until his serum sodium approached the normal range, but he started concentrating his urine while he was still hyponatremic (130 meq/L). To prove he was in the diagnostic category of SIADH, a water restriction test was performed to show urinary concentration in the presence of hypo-osmolality. His polyuria resolved once exogenous water was held, and his urine osmolarity rose to 685 mOsm/kg while his serum sodium stayed constant at 130 meq/L. In follow up out to one year, the patient’s serum sodium remained 131 meq/L off DDAVP. Representation of urine osmolality (osm) and serum sodium versus time in our patient. After discontinuation of desmopressin acetate (DDAVP) treatment (marked by dashed arrow) treatment, urine osmolality decreased to near-maximal dilution. A subsequent water deprivation test (marked by solid arrow) indicated preserved urinary concentration. Serum sodium levels remained constant during the water deprivation test. Figure 2 from Andreoli and Whittier, AJKD © National Kidney Foundation. AJKDBlog: Formal diagnosis of a reset osmostat requires a water-loading test. Can you explain how to perform this, and what criteria would be consistent with a reset osmostat? What is the expected response of this test in a healthy patient or in a patient with SIADH? WW: When a reset osmostat is clinically considered, confirmation requires a water load. Oral or IV D5W is administered (10-15 ml/kg), and in normal subjects or those with a reset osmostat, urinary dilution will eventually occur, with the expectation that >80% of the water load will be excreted within four hours. In SIADH, urinary concentration persists after the water load. Our patient presented in a backwards fashion, with a water load and dilute urine first, and later with inappropriate concentration of his urine. Algorithm. Approach to euvolemic hypo-osmolar hyponatremia. Abbreviations: NSIAD, nephrogenic syndrome of inappropriate antidiuresis; SIADH, syndrome of inappropriate antidiuretic hormone. Figure 3 from Andreoli and Whittier, AJKD © National Kidney Foundation. AJKDBlog: Your patient had a very unique clinical presentation – he was a practicing internist who was self-prescribing desmopressin due to polyuria, despite never having formal urinary measurements or a water deprivation test. In what other scenarios would clinicians encounter hyponatremia related to a reset osmostat? WW: The classic manifestation of a reset osmostat is in pregnancy, where the serum sodium decreases by 5 meq/L on average. Classically, this has been thought to be due to vasodilation leading to arterial stretch and subsequent ADH release (underfilling). The decrease in serum sodium in pregnancy correlates with levels of human chorionic gonadotrophin hormone (hCG), which increases the release of the vasodilatory hormone relaxin. Other more rare examples of a reset osmostat have been reported in cases of malnutrition, tuberculosis, and quadriplegia. AJKDBlog: Thank you for sharing this interesting case and taking the time to talk to us! 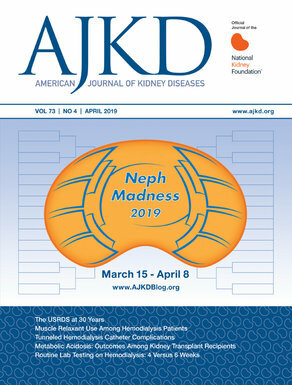 To view the Andreoli and Whittier Teaching Case abstract or full-text (subscription required), please visit AJKD.org. View the collection of Acid-Base and Electrolyte Teaching Cases here. Very interesting case. …thanks for sharing.